Previously, Mark Waser recommended A Totally Different Approach to Ned’s Bounty System – an ecosystem of small and simple bounty services rather than a single monolithic one-size-fits-all system. Today and over the next couple weeks, we’re going to start building out a very simple version of such an ecosystem. Other developers are welcome (nay, encouraged) to suggest extensions and modifications to our proposed standards and/or to replace any piece of the ecosystem with a better critter. Or, better yet, we've attached a bounty to this post. 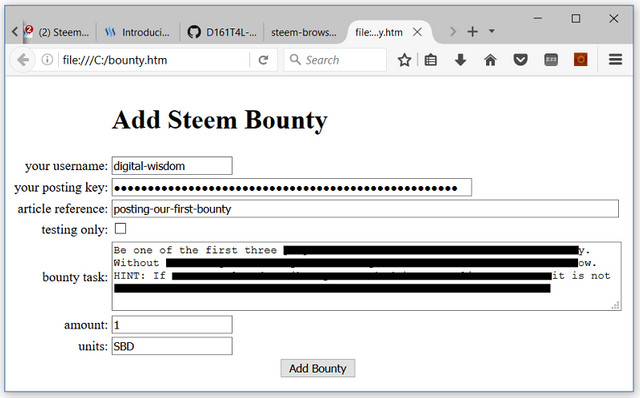 Just as with Steem SafePay, adding a bounty requires but a single, simple HTML file that can be used straight from your PC (with no web server) or modified and served by any web server to fulfill any bounty scenario. You can download bounty.htm from here. 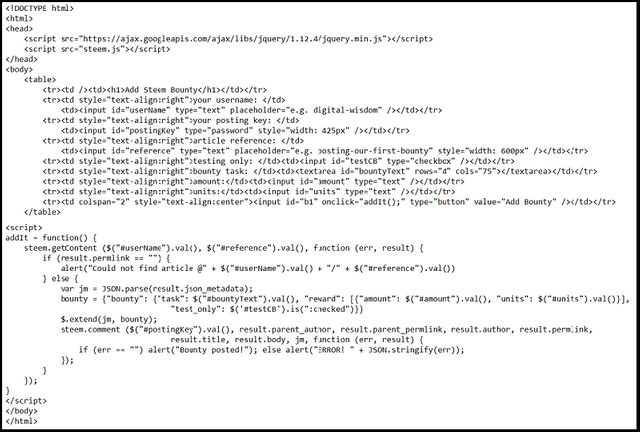 Steem-browserify's steem.js can be downloaded from here, pulled via npm or cloned from github. Stay tuned as our next posts will show how to integrate external services (e.g. escrow, judging, etc.) to this very simple model. Congratulations @digital-wisdom! You have received a personal award!